Maybe you have seen advertised “eyelash extensions” for $60, or seen at the nail salon simply “eyelash”. Well, the “eyelash extensions” you get for $60 are not actually eyelash extensions. Some people call them “individuals”, which can also be misleading. But actually they are cluster lashes (found at any drug or beauty supply store) that are just glopped onto the lashline with loads of adhesive. Often hair weave glue is used, but it can also be any number of different types of adhesive. And her final new set of lashes, applied to one natural lash at a time. No clumping, itching, or breakage; easy to comb through, soft, and beautiful. *please note what appears to be a gap is just a combing issue that will disappear when lashes are combed. Please be aware, when you go for an eyelash extension service find out if they are applied to “one natural lash at a time”. The process should be about 2 hours on the first appointment. If it is $60 and takes 20 minutes, definitely beware. The problem with these lashes is not only are they unsightly (I feel theydetract from a woman’s beauty, rather than add to it), they are also uncomfortable and damaging to your natural lashes. 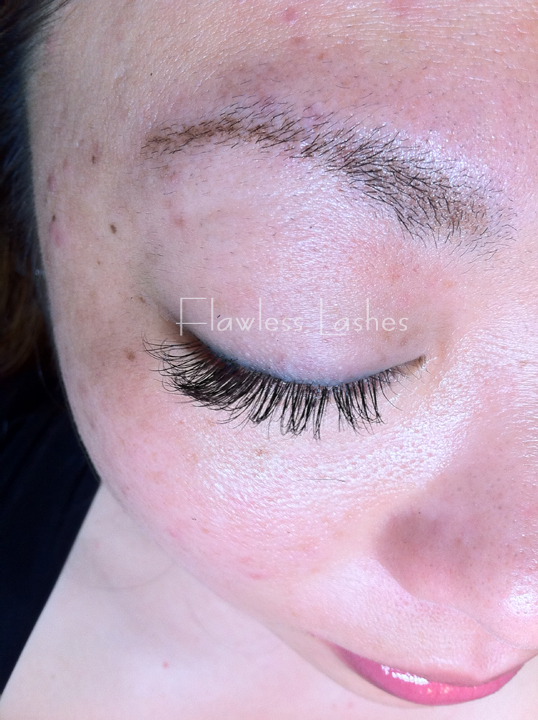 Once you spend the initial cost of a full set of real eyelash extensions, the upkeep for them is similar in cost to the cluster lashes, but with a much more beautiful result. 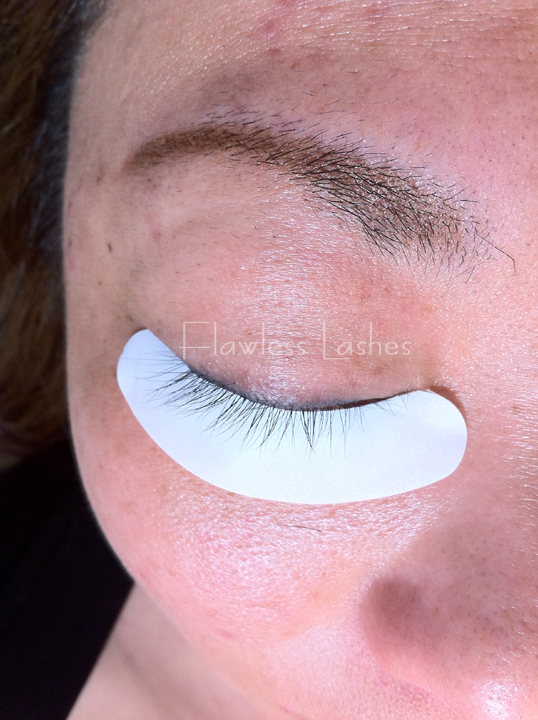 ← Flawless Lashes new location open today!